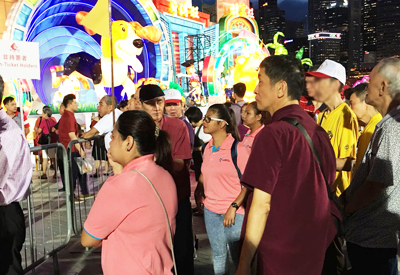 As part of St. Andrew’s Nursing Home (SANH) (Buangkok)’s efforts to encourage social interactions among residents and to enable our residents to enjoy festive celebrations, our staff brought 10 residents to River Hongbao at Marina Bay Platform Float on 22 February 2018. Despite their initial apprehension, our residents conquered their fear of crowds quickly and enjoyed the outing. Everyone was immersed in the celebratory mood and splendid decorations, with a display of 500 lanterns and beautiful fireworks. The night also brought back happy childhood memories for our residents as they visited stalls selling nostalgic food and an indoor exhibition which displayed life-sized models of a kampong house, an old Housing Board flat and a modern home dining area. Residents and staff of SANH (Buangkok) immersed in the festive celebration.